Amoo is a trailblazing boutique firm. We support pre- and post-VC technology startups with strategic direction and business development. Our experience covers advisory and fund raising services for high potential tech companies in their second or third year of operation looking for growth capital. We are geographically interested in OECD and Emerging Markets. 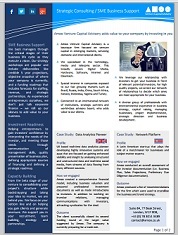 Please click on the image below to download our company summary, which includes case studies, highlighting what we do. Copyright © 2009-2016 Amoo Holdings Ltd. All rights reserved. Join our Venture Capital and Private Equity Network on LinkedIn or read more on the Amoo Venture Capital Advisory Blog.